The EMP-vulnerability of our electric grid, our machines, transportation systems, tools, and homes is probably the most glaring “acute-impact” threat on our horizon. According to IEET readers, what were the most stimulating stories of 2011? This month we’re answering that question by posting a countdown of the top 12 articles published this year on our blog, based on how many total hits each one received. The following piece was first published here on April 16, and is the 7th most viewed this year. This is serious and sobering stuff. The Electric Infrastructure Security (EIS) Council agitates for better infrastructure protection against electromagnetic threats. EMPACT America is a bipartisan, non-profit NGO for citizens concerned about protecting the American people from a nuclear or natural electromagnetic pulse (EMP) catastrophe. To be clear, we face other dangers of a chronic nature, for example the need to develop sustainable energy to escape dependence upon foreign oil-masters and to possibly save the planet. Educating a smarter generation and rescuing our decaying infrastructure also matter a great deal, over the longer time scale. There are two possible ways that we might be hit by an EMP pulse strong enough to cripple a continent. 1) Natural cycles can apparently lead to the sort of solar flares that did little to disturb our ancestors - other that creating scary-gorgeous aurorae - but that could devastate an electricity-dependent civilization. For example, the “Carrington Event” of 1859 and another large solar storm in 1921 show that such things happen fairly frequently, and we’ve been lucky, so far. A Congressional EMP Commission report recently estimated that a once-in-a-hundred- years solar flare could cause $1-2 trillion worth of damage, if the electric grid went down for weeks. Worse, if most truck transport failed, millions of Americans might simply starve. 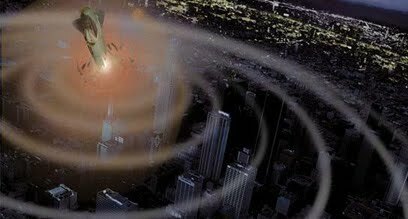 2) A devastating electromagnetic pulse can also be man-made. Already, more than half a dozen nuclear-armed nations have missile capabilities that- - now or soon—would tempt them to try knocking out Pax Americana with a single blow. Just one warhead, detonated high over North America, could cause untold amounts of EMP chaos. Weighing the scenarios, this is a no-brainer. Sending such a missile to take out one US city would be a nasty hit, but it would leave us almost intact and ready for vengeance. But knocking us back to the stone age? Far more tempting, whether it is realistic or not. With the number of nuclear armed states rising, is that a temptation we really want to be left on the table? Now, in full disclosure, let me say that I haven’t really pored through the thousands of pages of material, and there is certainly a lot I still have to learn about this topic, as it has evolved since I last studied it. But I have been talking about this general danger for 30 years, urging that a very small annual investment—perhaps as little as fifty million dollars a year, plus some arm-twisting with industry—could equip our grid and our vital tools to bear the brunt of such an event. The best time to act on this was decades ago. The second best time is now. * That is, other than a contractor greed-fest and wasting a trillion dollars on draining, debilitating “nation-building” land wars of attrition in Asia. Previous entry: #8: Atheists are the most generous—even without heavenly reward!